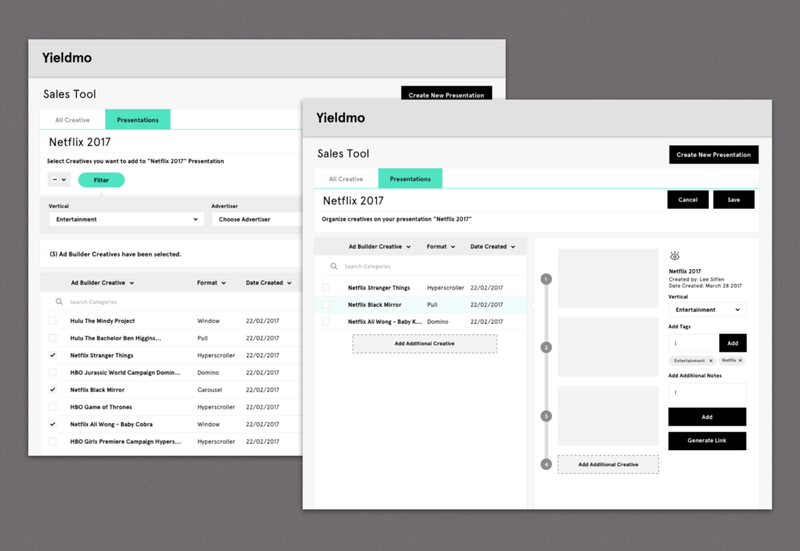 During the process of designing the Ad Builder 2.0 tool, our team worked with the Yieldmo Sales team so that we could better understand their needs. After some collaboration, we realized that Sales requirements were drastically different from the other internal users and advertisers who were also using the Ad Builder product. Their use cases and workflows were different enough that we decided their team needed a custom tool that addressed their problem directly. Sales reps needed access to an inventory of creative material, so they could quickly choose sample content when they went out to pitch to clients. It was also important for them to create a complete sales presentation on mobile devices. They needed to effectively demonstrate the creative content and Yieldmo’s ad formats on mobile, so that potential clients could see and interact with the content on their own devices during and after the sales pitch. The sales team used bit.ly links to showcase ad format mocks to prospective customers. The process was unpolished, not timely and didn’t provide the sales person the flexibility that they needed to effectively demonstrate, pitch, and present Yieldmo products pre-sale. In addition, prospective customers were not left with an experience they could refer back to. Provide a product solution that allowed sales reps to, with minimal preparation and effort, showcase the quality of Yieldmo formats to prospective customers, and do so in a way that inspired and delighted, reflected the Yieldmo brand and compelled the customer to learn more about Yieldmo ad formats and offerings. To start, we met with the Sales team to understand the problems they were having with their process and with the current product. We learned that there were four major themes that we needed to address. Inventory of creatives. A historical repository of ad formats live, how they can be sorted through types of funnels, and be grouped and added to a presentation. Creation & mock mode. Needing to create ad formats with creatives that are related to their pitches. Presentation mode. The ability to push the set of ad formats to a mobile device of their choosing, display the formats and link them to each other. Share. The ability to share the formats to the potential clients after the presentation. With those in mind we started to drill down and try to understand how we could accomplish all four goals within the same application. We decided to conduct a one day workshop session with engineers and designers from other teams to get some different perspectives on the problem. We also included some of our sales reps in the the workshop sessions, so they could talk to the team about the pain points from their perspective. Finding creatives was onerous. It was difficult to find creatives from the historical repository that were relevant to the client, and showcased Yieldmo’s abilities. Creating a presentation was time consuming and manual. Assets often needed editing which caused disruption to the sales workflow. Updating content and linking CTAs to the next ad format, in order to generate a presentation, was a manual process. Find creatives easily. Search and find creatives relevant to the pitch from an extensive repository of thousands of options. Assemble presentations easily. Automate the linking of creatives one after another with a simple click of a button without the use of Ad Builder, or other products. Creating links and presentations were the most time consuming processes. There would be a huge impact in efficiency if we saved the Sales team time in creating these presentations (demo URL links). We could group the four broader themes into two major categories - Inventory of Creatives + Creation, Presentation + Share, so we could create smaller lightweight applications. Sales people had different processes and organized their files differently, from one another. Sales reps shared creatives from their pitches amongst the team, but they had to manually duplicate or recreate the content for new pitches. The use of bit.ly links as workaround wasn’t being done for analytics, just for shortening the URL. After the workshop, we gathered the feedback, started to distill the information and created some high level wireframes. 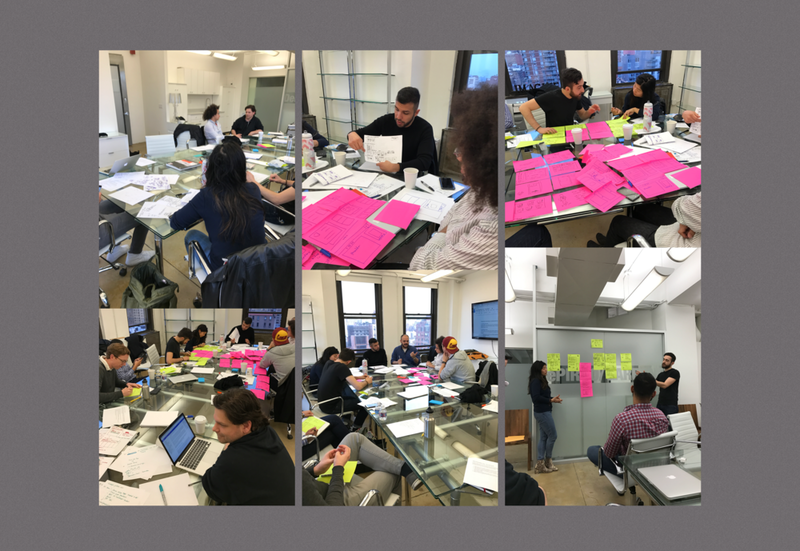 We wanted to make sure that we understood all of the use cases and user flows before we went into final designs. We presented the high level wireframes to the Sales team, made some adjustments based on feedback and created an InVision prototype to test on them. We wanted to make sure that we got all the user flows finalized before starting the implementation of the tool. Finalize use flows and user interface designs for build phase (inventory + create mode). Get it on the engineering roadmap.